Niche, aka Niche, is a 10-year-old white and fawn female born January 23, 2002. Her sire is Flying Train, and her dam is Helen Knows Best, making her a sibling to Simone, and mother to Achilles. Niche has 54 races to her credit on Greyhound-data.com, starting on August 20, 2003, at Lincoln Park in Rhode Island, and ending there on September 14, 2004. 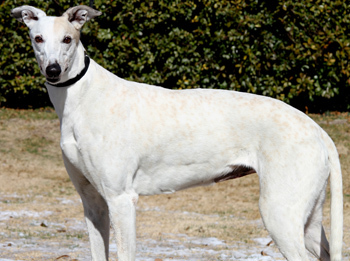 Niche was the $10,000 winner of the 2004 Lincoln Greyhound Park's St. Patrick's Day Stake. 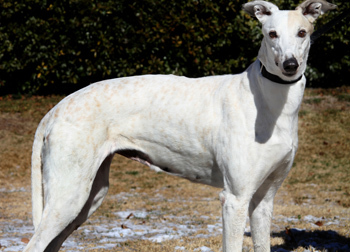 She then went on to whelp 2 litters of pups, 8 registered with the National Greyhound Association with WW Apple Jax on June 10, 2005, and 4 more with the Irish bred Pacific Mile on July 9, 2006. Those days are in the past, and this girl needs to be on a family's couch or dog bed! Niche is not cat tolerant but is fine with small dogs. Niche is a sweet, beautiful and gentle girl with the softest coat you have ever felt. She is the perfect house guest having never had an accident in the house. She is content to relax either on her soft bed or right next to you. She is very affectionate and loves a good tummy rub. She sleeps through the night in our bedroom on her bed. She does fine in the crate when we are gone. Niche would do well as an only dog or with a canine companion. If you would like to add a gentle loving member to your family, come visit Niche and prepare to fall in love!